This weekend my dad was able to stop by on his way home from Oklahoma. He came bearing gifts(Thanks Grandpa! They were a hit!) and we enjoyed having him hang out with us for a bit. We took a few groups pics and I think they turned out really nice. 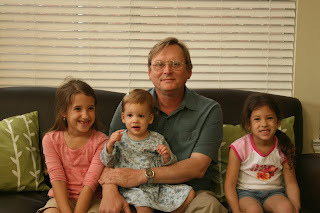 . .
Grandpa and his big girls :) Tara came by too-yippee! 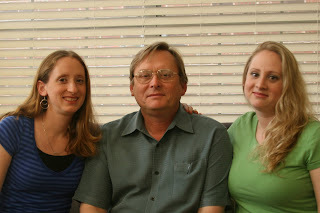 I thought I'd get in a picture with my dad and my daughters. I think this picture turned out sweet. And I can't believe all 3 girls are smiling in this one! Woohoo! Its always hard to get all the kids to look at the camera AND smile at the same time(Well, mostly its hard to get Cali to do that. Somebody must have either shouted out "Candy!" or "Did you fart?" to get her to smile that big:). We love you Dad(aka Grandpa) and were glad to get to see you! We miss you already. I'm glad dad got to come by and see you guys. I'm just sad I wasn't with him but I'm excited to see you guys in a couple of weeks. Grandpa's are the best! I'm sorry your dad doesn't live closer. Looks like you all had a wonderful time with your dad! I know how hard it is to get everyone to smile in a photo. 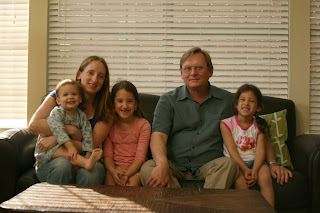 When I had the five kids at home, it was nigh on impossible! You did well! It was a fun visit! And thanks for cropping that photo, lol. What a fun visit. I love seeing you and your girls with your dad. Looks like you had a fun visit with your dad. Grandpa's are so much fun. How fun for your dad to pop in. Great pictures too. I love the one of you and your girls and your daddy. Priceless! It was great getting to see everyone, definitely the highlite of my trip. Amazes me how fast the girls are growing up .. love you all. Aaaawww! How fun! What great pictures! My kids are missing their grandparents something fierce! That's so cool that grandpa could come and visit. I love the pictures of everyone. So much fun to see grandpa and play. Yeah for grandpa's.